· The signing of the International Agreement and, finally, the adoption of Resolution 33/55, by which the establishment of the University for Peace was approved in order “to provide humanity with an international institution of higher education for peace and with the aim of promoting the spirit of understanding, tolerance and peaceful coexistence among all human beings, to stimulate cooperation among peoples and to help lessen obstacles and threats to world peace and progress, in keeping with the noble aspirations proclaimed in the Charter of the United Nations”, whereby it would carry out its activities within the United Nations University system. The most important document of the University for Peace is its Charter which prescribes the aims and purposes, legal status, organization and functioning of the Council of the University for Peace, as well as other relevant issues. The Annex to the Charter presents the general principles of the University’s “struggle for peace”, primarily through “education for peace” (Resolution 33/55 and the UPEACE Charter). The Decision on the composition of the Council, as the governing body of the University, was made by the UN Secretary General and it was published in the Bulletin of the UN Information Office in September 1981. At the inaugural session of the Council, Rodrigo Carazo Odio, President of Costa Rica, appointed Professor Simonida Marjanović to be President and, Vice - President of the Executive Council of UNESCO. By constituting the Council, the responsibility for the work of the University for Peace was transferred to the Council, and the responsibility of the Council to the UN Economic and Social Council. Within the framework of the above mentioned Charter, the Council of the University for Peace is authorized, inter alia, to establish such organs and offices as are required for the fulfillment of the purposes of the University for Peace. In accordance with these provisions (Article 4 and Article 7(h) of the Charter), the European Center for Peace and Development was established as an autonomous educational and research European regional organization. Bearing in mind the significance of the European region and in accordance with the provisions of the Charter of the University for Peace, the Council of the United Nations University for Peace decided, by its Resolution UPEACE - C2/19 of January 20, 1983, to accept the proposal of the Vice - President of the Council, Professor Simonida Marjanović, to establish, in agreement with the Government of Yugoslavia, the European Center for Peace and Development headquartered in Belgrade. The publishing of Resolution UPEACE - C2/19 of the Council of the University for Peace in the official UN Bulletin attracted the attention of a number of European countries. Interest in hosting the ECPD was shown by those countries in which some of the specialized agencies within the United Nations system were already operating, or whose capitals had already been the venue of conferences on peace and security in the world. However, after considering the relevant factors, as well as the authority of the institution which had submitted the proposal, the Council of the University for Peace decided that the headquarters of the ECPD should be in Belgrade. The ECPD is an international, regional and extraterritorial organization. It enjoys the academic freedom needed to fulfill its mandatory tasks and objectives. The Yugoslav Government responded positively to the initiative of the Council of the University for Peace. On October 22, 1984, the Yugoslav Government and the University for Peace concluded an International Agreement on the Establishment of the European Center for Peace and Development, with headquarters in Belgrade. Among other things, this Agreement defined the Status of the ECPD (as an extraterritorial, autonomous, educational and research regional institution with headquarters in Belgrade) as well as the financial and other conditions for its future operations. The International Agreement underwent the appropriate parliamentary procedure, including its ratification, which was signified by the Law on the Ratification of the Agreement of 22 October, 1984, and the Decree on the Promulgation of the Law on the Ratification of the Agreement of July 17, 1985. These three documents were published in “Službeni list SFRJ – Međunarodni ugovori” (“Official Gazette of the SFRY – International Treaties”) No. 9/85, July 26, 1985. By this act, the European Center for Peace and Development, with headquarters in Belgrade, came into existence and that was also the date on which the ECPD began its activities aimed at promoting peace, development and international cooperation. After the events which led to the dissolution of the former Yugoslavia (SFRY), the Government of the Federal Republic of Yugoslavia (FRY) assumed the obligations of the SFRY, arising from the mentioned International Agreement on the Headquarters of the European Center for Peace and Development, in keeping with the continuity of Yugoslavia as a state. 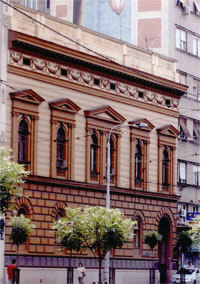 In addition to respecting the above mentioned extraterritorial status, which implies specified privileges and immunities, the Federal Republic of Yugoslavia (FRY) assumed the obligation, later on the Republic of Serbia, as its successor, to provide (adequate premises for its administrative headquarters in Belgrade) for the use of the European Center for Peace and Development. The ECPD carries out its tasks and objectives from Belgrade, Terazije 41 and Kablarska 29. The ECPD may carry out its activities in other premises in the territory of the Republic of Serbia and territory of all countries which emerged from former Yugoslavia. The Governments of the interested European countries make - at their own discretion - contributions to some projects and activities of the ECPD from their budgets. As regards material and financial support for its activities, the ECPD is an autonomous organization which covers the costs of its activities from contributions made by international and national organizations, interested in concrete research programs, international scientific and expert meetings, as well as from tuition and registration fees paid by participants in the ECPD postgraduate studies at the specialist, master’s and doctoral levels, as well as in other courses and seminars. The European Center for Peace and Development enjoys academic freedom required for the achievement of its aims, especially with respect to the selection of topics and methods of research, academic personnel and other staff, as well as educational programs and forms of disseminating knowledge with a view to promoting peace, development and international cooperation.